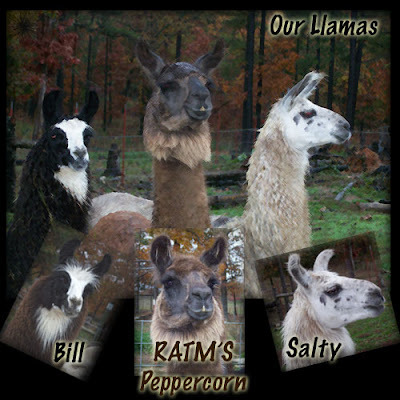 Here's a photo poster I made of our llamas. Enjoy :). Yesterday we got a big load of beautiful Alfalfa/Orchard grass hay delivered from Missouri. It is very nice hay at a very good price also. If anyone is looking for a good source of hay in the Missouri area, email me and I'll give you his contact info. Since we got that load of hay, once I am done feeding the last few bales of Alfalfa that I have left, I will only be feeding the milkers the mixed hay. They seem to like it a lot better than straight alfalfa, and that way everyone will get the same kind of hay. Not too much else to update on. It's been raining here a LOT and everything is wet and muddy ;). WELL, guess what we got today?!? 3 llamas! We've been wanting to get some for a long time now, ever since we got rid of our others. But anyway, these ones are just so pretty! We got 1 male and 2 females (who, are more than likely bred as they have been housed with the male). They are very, very soft and beautiful (& handsome). They are slightly on the wild side, but they'll come to the grain bucket and one is halter and trailer trained. The other two I am going to work with more. Here's some pictures and more info on them. The male is the black & white one in the front. He is only 2 1/2 years old. His name is "Bill." I might be able to get him registered, we'll see. Isn't he handsome? His sheared coat is just pure black and shiny! I'll have to get some good pix of him tomorrow or Tuesday. This is one of the females. She is very pretty and my favorite (wait... I think) so far. Once you catch her, she is completely halter trained and loads in the trailer just like a pro. I don't know her name though - forgot it! I'll just ask tho :). She is about 7 years old. And this is the other female. She is registered and her name is RATM'S PEPPERCORN - I call her "Peppercorn" or "Pepper." She is a completely different style than the other two - I don't know if "bulky" is the right word, but she is wider. I still have to learn all the different styles of llamas :). She is 8 1/2 years old. So that's it for the llamas. The other day I straightened, cleaned and made the kidding stalls. Here's what it looks like at the moment - it may change with time ;). Some of the "medicine cabinet". There are a lot of meds in the fridge and a lot of other care items in a big huge shelf/counter in the milk room. Not a lot else to update on. We finally sold the two meat bucks that we had for sale - yay! Now we (only!) 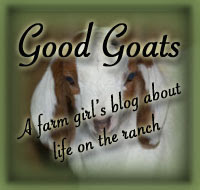 have 1 Boer buck, 1 Nigerian buck, 4 Mini Nubian bucks, 2 Mini Nubian bucklings, and 1 young Boer/Nub wether. So not bad :). I haven't posted in a while, as I have been super busy! Monday we got two new Alpine does - a new breed for us! Aruba is 2 1/2 years old, is in milk and just recently bred. Honey Bun is 1 1/2 years old and is in milk (she kidded in June). They are both beautiful does with nice, easy to milk udders, and come from some great Alpine lines - some does in their pedigrees were Top Ten milkers, and National Grand Champions. They were only being milked once a day, but we are milking them twice a day and their production is picking up very quickly! Well, here are some pictures of them (they have empty udders in these pics). We've been busy - gone in town doing things, but not too much other than that really! Everything is looking very much like Fall, very quickly. Seems like all the leaves turned different colors just within a few days. . . very pretty though. I'll have to go out with the camera later today and get some photos before they all fall! Well, I don't have all that much else to update on. Have a great day! I made regular vinegar/Queso Blanc/Ricotta/soft cheese/whatever you want to call it cheese this morning, and decided to take pictures of the process, like I did with the butter making blog post. So here you go! First, put 1 gallon of milk in a saucepan over medium heat. Stir occasionally. While you are waiting for that to warm up, get 1/4 cup of Apple Cider Vinegar ready. If it does not separate pretty quickly, add more vinegar. Once it separates, remove from the heat. While you are waiting, get a bowl or saucepan with a strainer lined with cheesecloth. When the timer is up, pour the cheese through the cheesecloth. Let it drain for a few minutes. It will be very hot, so be careful. The liquid left over is whey. You can use in it soups, bread, any kind of baking, etc. OR, feed it to the dogs and pigs :). Now take the cheesecloth with the cheese in it, twist the top (so the cheese does not fall out) and rinse it under cold water for a couple of minutes. This helps make it tastes better, IMO. While you are rinsing it, kind of "massage" the cheese with your hand to really rinse it well. Now put your cheese in a bowl. You can either eat it like this, or flavor it. If I flavor it or not, I always salt it. This batch I flavored garlic/italian, and these are the seasonings I used. And this is the cheese seasoned and packaged. Well I hope you enjoyed that! Well to say the least, it was a very busy and exciting weekend! Some new friends came from Canada Friday and left yesterday, and needless to say it was a very good time. The house is somewhat of a mess from everyone being over during the weekend. But such is life :)! Today I bred Urban Acres C Blueberry Cream ("Blueberry" - I finally have her papers after waiting for a year+!) to SQSW Berry Blast ("Berry"). They are both blue-eyed. I housed Berry with another yearling a few weeks ago - she was in heat, but I didn't see him breed her, just saw him try. So if it did not get her, she will be coming in soon as it's been 18 day today since then. I hope he did! I was right there though when I bred him to Blueberry this morning. Yay - the "little buck" finally was able to breed a doe! For a quick "update", we are now milking 16 does/AM and 14 does/PM. I am going to drop a couple more does to only 1x/day milking. In the morning when I'm moving slightly slow, it takes about 1 hour to milk and feed, and at night about 45 minutes. We also now have 13 dairy does bred, and several left to breed! 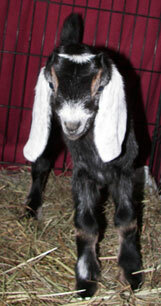 The new Boer buck, Ace, has bred several of the Boer does now also (at least 4 I think). We still have the paint Boer buck (18 months), cross-meat buck (8 months), and Boer/Nubian doe (2 1/2 years) still for sale. I would really like to move the 2 bucks out ASAP - so we will accept any reasonable offer! 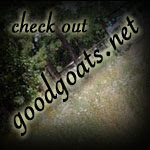 Email or call me if you are interested (sf@goodgoats.net - 918-598-4004). 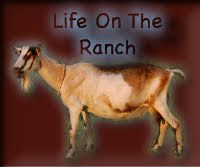 I don't have a whole lot more to update on ranch life, so. . . have a good day! I am just doing a quick blog post here, as I have a very busy day ahead of me. Yesterday and Tuesday we were in town, today the house needs quiet a bit of cleaning, and I have a gallon of cow cream to make butter with and then I have to make cheese with some goat milk. So that'll be a couple of hours in the kitchen. And for outside work, the kid stall outback needs some straightening-up and the stalls need cleaned. The new buck barn has a few holes in the roof (we found out last night while it was raining) so those need fixed and the dirt needs to be leveled as it's sort of flooding right now - just the edges. And the half-front of the doe barn needs put back up as the rain is coming in. Plus, this is the month for family members to move here and visit! SO all that to say, it is a very busy month! Time for updates! Friday we got our new big Boer buck, PNTD ACE IN THE HOLE - "Ace". He is a beautiful buck! He's only 2 years old and weighs about 200 lbs. He is a gentle giant, although he did bend the buck fence trying to get in with them ;). But they all worked it out and are fine now. This morning when the dairy does were out getting milked, we had Ace in with the Boer does and he bred 2 of them, Gandy and Cricket - YAY! Here are some pictures of Ace. Well I am editing this post now to add a few things. Riding went good - practiced roping and only rode for a little bit. As for other additions on the ranch - the new buck shed is almost done. We didn't realize we were a little short on materials for the sides, but it is working out. We did sheet metal for the roof and one side, old plywood for the long side, and then for the other side - we still have to figure that out! Either dig through the lumber pile, or go buy a few pieces of sheet metal. We'll see. I'll have to take pictures when it's done. Yesterday I also started to put insulation back in the doe barn. It's SO COLD here (well, maybe I'm a wimp) - but today it has been about 50 with a cold windy/breeze, and even colder in the mornings. . . the other morning it was 37! Brrr. . . if you can't tell I am not ready for winter :)! Anyway, I just have to finish insulating the doe barn and put the half-front on. And that's it for the DOE barn. The little log-loafer still has to be finished, and the whole long list of things to do.